WORLD CUP DNA FOR THE REST OF US. 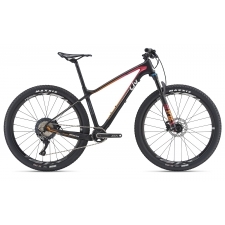 An XC weapon with a World Cup pedigree, the F-Si combines modern XC geometry with our renowned SmartFormed Alloy frame construction to deliver killer race performance at a more approachable price. High level performance in an unbeatable package. Built for modern XC racing. Aspiring XC racers looking for a biketo take their performance to the next level. XC AGILITY MEETS ALL-MOUNTAIN STABILITY: Lefty-equipped models get full OutFront Steering Geometry, while others use the longest fork offsets available to balance high-speed stability with low-speed agility. WINNING TRACTION: Smart tube shaping and a curved seat deliver tight, short chainstays for exceptional lateral stiffness and race-winning traction. UNCOMMONLY SMOOTH: SAVE micro-suspension technology uses proprietary flattened and shaped seat and chain stays to provide a surprisingly smooth ride. FIT-FOCUSSED WHEEL DIAMETER: Specifically designed around 27.5 wheels to achieve the best possible fit, geometry and ride characteristics. WOMEN'S SPECIFIC COMPONENTS: Women's saddles, shorter crankarms, slightly narrower bars and components specifically chosen to achieve the best fit for female riders. Buy your Cannondale FSi 27.5 Alloy 2 Women's Mountain Bike 2017 from Revel Outdoors.